Perhaps you’ve heard someone make a comment about a house they’ve recently visited along the lines of: “I could tell they had cats the second I walked in because of the smell.” We all love our pets dearly, but we also want to make sure nobody ever cringes in olfactory disgust upon entering our homes. Oh, the humiliation. Kitty litter maintenance is a simple daily step you can take in the fight against litter box smells. Keep a scooper near the litter box, and make scooping your cat(s) daily offerings a chore you do at the same time every day. If you can train yourself to do this daily by pairing it up with something else you do every day, you will do it consistently, and your house will smell better for it. Splurge on an effective kitty litter deodorizer additive. 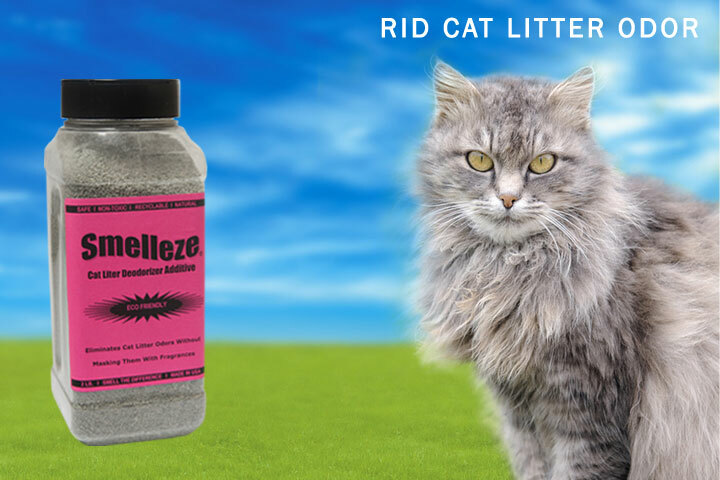 I recommend sprinkling Smelleze™ Cat Litter Odor Control Deodorizer Additive on the kitty litter when it gets smelly. If you can also do this when you change the litter, it is better, because it will prevent the kitty odors. This is a natural substance that won’t harm animals, and it has amazing cleaning powers. It can freshen up a litter box by absorbing bad odors in no time. Use a litter box with a lid to hold in the smell. This also holds in the litter your cat may scatter around the room otherwise while digging, keeping your home cleaner. Change the filter in the lid once a month, because it not only helps to contain the stench, it keeps the dust from the clay litter from escaping, improving your indoor air quality. Use the plastic litter box liners sold to fit litter boxes, or improvise with trash bags if that’s more affordable for you. Just make sure to create a plastic barrier between the litter box and the animal waste so bad smells won’t attach to the permanent structure. Be proactive about removing cat-related odors. I suggest placing Smelleze™ Reusable Pet Smell Eliminator Pouches in each area your cat frequents. This natural deodorizing product will constantly attract, absorb, and remove unpleasant feline smells 24/7. That will prevent odor build-up and keep your home from reeking. This deodorizer is also reusable and can be used for many years to save you money while helping the environment. Keep a small dustpan and hand sweeper nearby to clean up litter and pieces of waste dragged out of the litter box on kitty paws. If the cleaning tools are conveniently located, you will stay on top of this maintenance, and less litter will be tracked around your house. Change your kitty litter often, with once a week being the typical time frame for one or two cats, and twice a week for three or more. They’re being good kitties and going where they’re supposed to, so you want to encourage this great behavior by giving them a sanitary place to do so. As mentioned above, also consider sprinkling Smelleze™ Eco Cat Litter Odor Control Deodorizer Additive at the bottom before adding the litter for extra odor protection. Make friends with the vacuum and broom. The same thing that makes our little feline friends adorable, fluffy and soft to the touch also makes a bit of a hairy mess in our homes if we don’t stay on top of it. Set aside a certain day every week for hair removal to sweep hard surfaces and vacuum carpets. For extra effectiveness, sprinkle some Smelleze™ Natural Carpet Smell Deodorizer Powder on your carpets prior to vacuuming to get any lingering get kitty smell out and to freshen the carpet. This is a cat-safe and people-safe deodorizer. Place blankets or towels in favorite lounging areas. Cats tend to find a favorite sunny window or chair to sleep in and spend hours there every day making us feel jealous of their ability to sleep so well. By keeping blankets or towels over those areas, you are creating easily cleaned, removable liners to gather stray fur. And rather than trying to clean furniture upholstery, you’re protecting it. Brush your cat regularly. If your cat will tolerate this—and many love it—removing extra hair before it is shed will keep your house cleaner and reduce hair cleaning maintenance work for you later. With a little forethought, planning and good maintenance habits, it’s really very easy to keep a house with cats smelling fresh and clean. If you’re noticing a little kitty odor in your home, try some of the tips above to clear the air. Samantha Wright is a professional blogger that provides advice for home remodeling, home repairs as well as carpet and tile cleaning in Omaha. She writes for Simply Steaming, the top carpet cleaning company in Omaha NE. Hi, I am in Sydney Australia. Could you please tell me if you ship to Australia or if you have distributors here. Yes, we do ship to Australia, we only offer our product online or over the phone!